Dr. Martin Luther King Jr. visited Kansas State University on Jan. 19, 1968 where he spoke to a crowd of 7,000 at Ahearn Field House about racial inequality in the United States and advocating non-violent actions to bring about change. 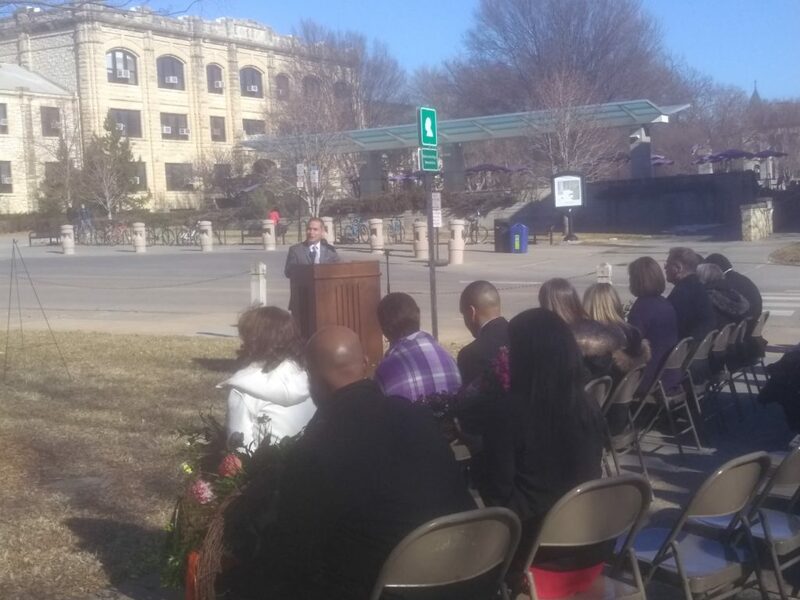 Many from K-State and the community came out to keep his memory alive at a wreath-laying ceremony at the bust of Dr. King outside of Ahearn Friday. The ceremony capped off a week full of observances around campus and was preceded by a procession leading from the Multicultural Student Organization Office, through the University Student Union Courtyard, before arriving at the bust. 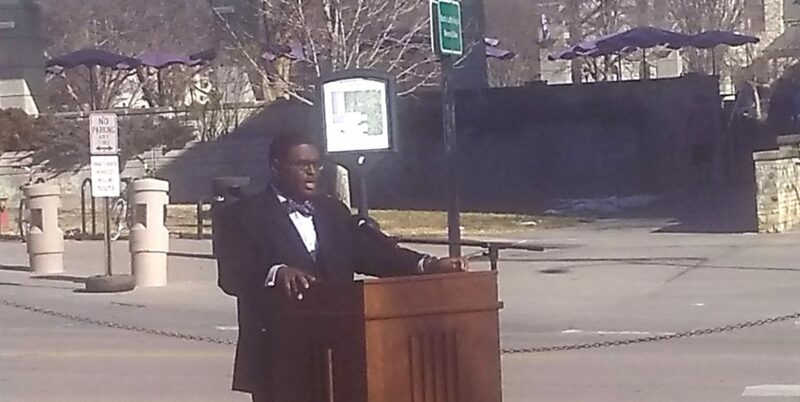 Multiple speakers gave remarks about the legacy and message of Dr. King. 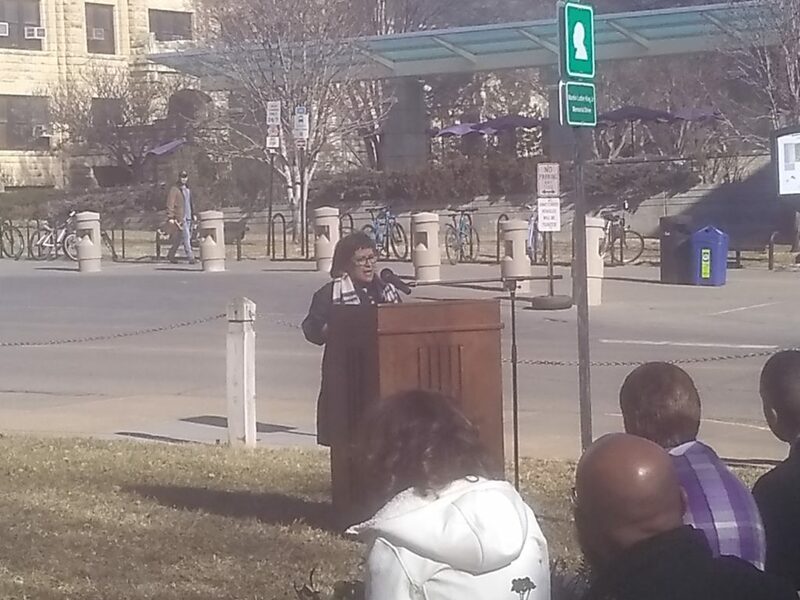 Dr. Debra Bolton, director of intercultural learning and academic success, spoke of Dr. King’s belief that a person is truly measured based on where they stand in difficult times. Dr. Adrian Rodriguez, associate vice president for student life of diversity and multicultural student affairs, says the week is not only about remembrance. Rodriguez says to see the wreath laying as more than a tribute, but also a commitment to live up to Dr. King’s ideal and work to make the university and beyond a better place. Dr. Bryan Samuel, chief diversity and inclusion officer, echoed the words of Dr. King that “the greatest thing we can do as human beings is to do something for others,” and asked the crowd what their reason for living is. Samuel also says the week’s events were unlike any of the 5 other campuses he’s been on, which spent one day of reflection on Dr. King. The Kappa Tau chapter of Alpha Phi Alpha also took part in the ceremony. Dr. King joined the Sigma chapter of the fraternity while attending Boston University in 1952. 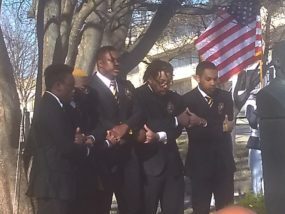 Their chaplain, Kemondre Taylor, recited the poem Invictus by William Ernest Henry before he and fellow Alpha Phi Alpha brothers sang the Alpha Hymn. “As we conclude this university-wide MLK week of observance, I hope all of us will continue the work and strive toward the values of that of Brother King gave his life for and that we remember to never lose hope,” Taylor says. The keynote speaker was Dr. David Griffin Sr., former assistant dean of K-State’s College of Education and director of the Center for Student Success and Professional Services. He spoke of Dr. King’s legacy and recited some quotes by and about Dr. King that exemplified his beliefs and commitment to fighting injustice and called on those listen to live up to the nation’s creed. The ceremony ended with the K-State clocktower tolling the tune of the song We Shall Overcome. Standing among the crowd was Riley County Police Department Director Dennis Butler. Butler was a child in the 1960s and says he was “somewhat secluded from what was going on in the world” as he grew up living on military bases. “I think it’s really important for us in the community to never really forget what Dr. Martin Luther King stood for, what he meant to our society in terms of making us aware of the injustices that have been occurring ever since the formation of this country,” says Butler. 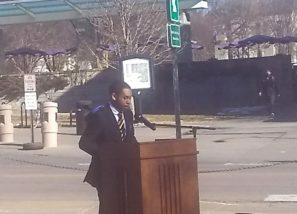 The post Observers encouraged to further work, beliefs of MLK at KSU ceremony appeared first on News Radio KMAN.